A proposed high speed rail link between Toronto, Kitchener-Waterloo and London would see 56 trains a day, or 28 each way, with fares around $40, according to Glen Murray, Ontario's transportation minister until the election call. 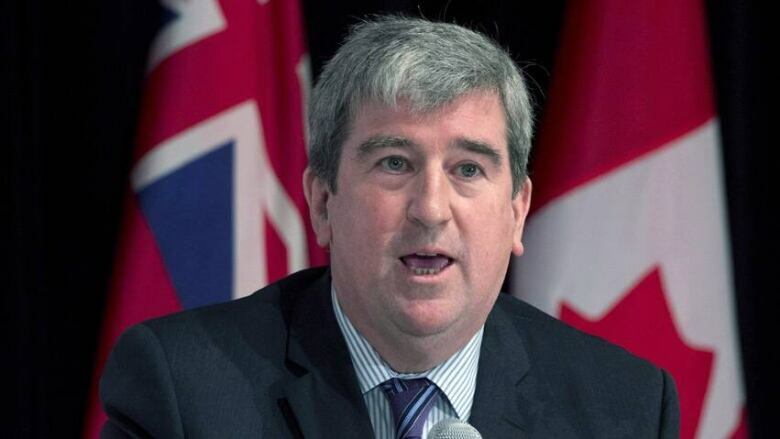 Glen Murray, who was Ontario's transportation minister until an election call earlier this month, has laid out an ambitious plan for rail expansion in southern Ontario - including money-making, low-cost high-speed rail. A transit expert is skeptical of the plan. A proposed high-speed rail link between Toronto, Kitchener-Waterloo and London would see 56 trains a day, or 28 each way, with fares around $40, according to Glen Murray, Ontario's Transportation Minister until the election call. In an exclusive interview with CBC News, Murray said the high-speed rail service can be completed within 10 years, and would cost between $2 to $3 billion, which is part of the $29-billion infrastructure fund announced by the Liberal government in their spring budget. "For a lot of people it will be a $10, $20, $25 ride if they're doing it every day. If you're a frequent rider you pay a much lower fare, if you book early or in advance you get a lower fare and if you're an infrequent rider who rides it once or twice a month you're probably going to pay a higher than $40 fare," said Murray. "If you're going to use it to commute it will be very inexpensive. If you're someone who's living in London who's going to the airport at the last minute it will be more expensive. The average fare will be $40 a ride going from London to downtown Toronto," he added. Murray is basing his figures on a study by independent transit consultant First Class Partnerships, based in London, England. According to that study, the net cost to the government for capital investment on high speed rail would be about $500 million, once fare revenues have recouped the investment, though the total cost is not specified. Murray was not able to release the report to CBC News because he can't access ministry materials during an election campaign and a spokesperson for the Ministry of Transportation said it was a pre-feasibility study that could not be released to the public because it contained confidential information. "It will probably generate, over the next 10 to 15 years, over $2 billion. So we expect the net cost over the next 10 to 15 years would be about $500 million — at least, that's what the experts say," he said. Murray said Metrolinx, the authority that manages transit in the GTHA, may not be the operating agency of the high-speed rail link, although they are involved in route planning. He suggested that the Ontario Ministry of Transportation would likely operate the line, but the decision had yet to be made on who would operate it. Murray also confirmed that a new rail line would need to be built between Kitchener and London. "In the initial study that was done it looks like a new line from Kitchener to London would be the least expensive. We want to protect farmland so we want to make sure we use a highway or road corridor that would have minimal impact on farmland and communities. But that is all work that would be done in the next 2-3 years with the environmental assessment," said Murray. The high-speed rail link is the third step in a three-step process Murray described to CBC News. The first step, already announced by the Liberals, is to increase GO trains between Kitchener and Toronto to 4 trains each way per day by 2016. The second step is to move to two-way, all-day GO service within five years, according to Murray, and then complete a high-speed link in 10 years. "We will likely amalgamate the Union-Pearson Express into the high-speed system because it would be a duplication otherwise, which is one of the other reasons it is less expensive," said Murray. The Union Pearson Express is the rail link between the airport and Union Station in downtown Toronto that is slated to open in the summer of 2015. It's not clear whether Murray's proposed fare would include the section of the line from Pearson to Union, or if that cost would be additional. No fare has been publicly announced for the Union Pearson Express. Toronto-based transit advocate Steve Munro is skeptical of Murray's plans for high speed rail. "The fundamental problem I have is that I haven't seen an estimate of what is the travel demand between London and Toronto. I can certainly believe there's a strong travel demand as far as K-W," Munro said. Munro wants to see numbers on projected ridership for the service. "There's really two parts of it, the first one is, you need to know how much they expect it's going to cost to run these trains. Because then you can do a basic reasonableness check of the operating costs of the new service versus whatever they're running today, like GO transit," he said. "That's the one side, and then you turn that around and say, 'Okay, if it's going to break even, here's how many passengers at $20 a pop, at $30 a pop, at $40 a pop, you need to break even on it. And is in fact that going to be a likely ridership?'" "The fact that they have not released the background paper on the grounds of commercial confidentiality, well wait a minute, you're talking about spending $3 billion of public money and you're not prepared to give us the report that you're justifying this with? Can you say gas plant?" said Munro. "One of the first things we want to do if we're re-elected is get those studies out there," said Murray. But Munro questioned Murray's assertion that the high-speed rail line could make money. "It's truly astounding how all the transit and transportation projects we've got, nobody expects to make money on any of them, and yet here's a proposal where he thinks he's going to make money on a high-speed train to London," said Munro. It's a concern echoed by Region of Waterloo Chair Ken Seiling. "If it was strictly provincial projects then I think there would be some difficulty, but if in fact they have a P3 approach which lets the private sector do it and takes on the financial risk, then possibly they can do that," he said.